Spring is in full fling as my allergies have been killing me this last week. Regardless, I am still out doing what I love to do; fly fishing. Its been really windy and warm which basically means I feel miserable which therefore means that I am not really enjoying being out as much as I would like to. I'm still chasing carp at Horseshoe Lake and managed to hook a few but no landing as of recently. I'm currently on sort of a mini vacation at home and fished Ellis Lake and the Yuba river. The weather today was pretty warm and windy. I was hoping to find some carp like I did last week but were no signs of carp anywhere. Nick and I fished around twice, once in the morning and later in the afternoon with no luck on anything big. 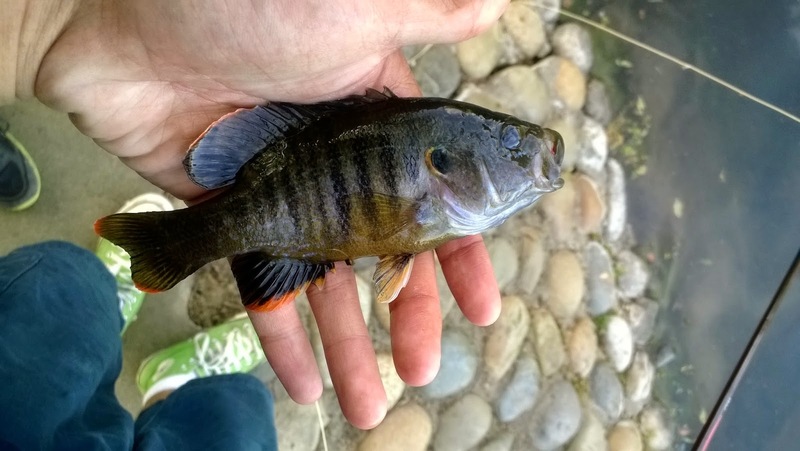 The bluegills were taking every fly we tossed in front of them though. 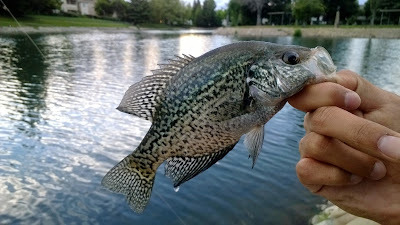 The only fish worth bragging about were the two crappies that I hooked. For some reason the bass are not very active still. I'm guessing their in early lockjawed postspawn. I'm going back tomorrow to see if I can get into some bigger fish. The water is low around 761 CFS. Nick and I fished a honey hole and I manage to hook into a nice rainbow. 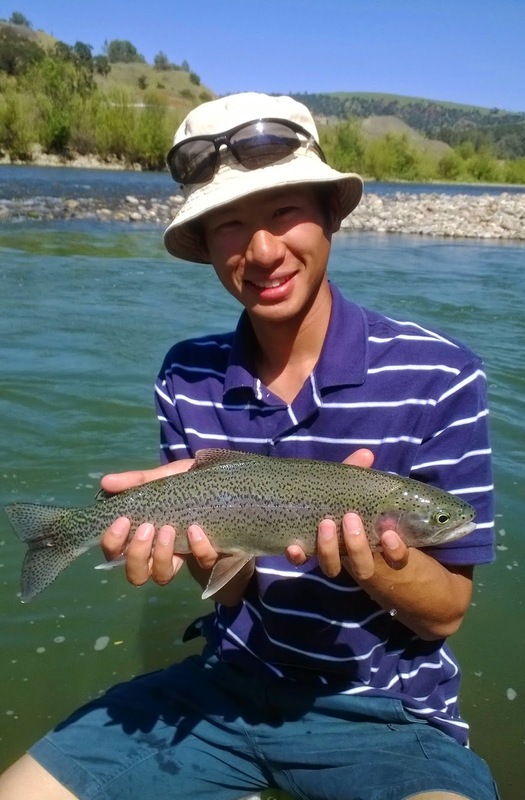 Although Nick didn't land anything, he learned how to truly fly fish which was pretty cool to watch. He did get some takes but no hook ups. I probably won't spend too much time on Yuba due to the low flows and spooky fish. Nick and I hit up the Yuba River again and there were a few guide boats out. I managed into hook two small trout before we left. The river and weather was beautiful but the fish just weren't hitting as well as I had hoped. 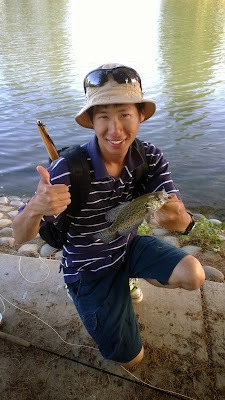 After a small break I decided to go fish Ellis Lake before heading back to Chico. I was there for several hours and managed to be there during the bread hatch. The carp were feeding on the bread that people had thrown in hours back. I managed to hook two but the first one snapped off and the other one spit the hook. These carp learn fast and refused my fly several times. Needless to say I was disappointed but that's fly fishing for you. I'm hoping to get back out there soon and land another Ellis Lake monster carp. dude, honestly, I had NO idea there were crappie in Ellis Lake! I have heard of bass in there but never seen tehm either. Good job figuring that lake out. Throw a clouser minnow (green and white works best for me) about 10 ft out then strip it back towards the bank. You will catch every single species of fish in that lake in every size with it. Just be careful not to strip it in too slowly or else it will snag on the rocky bottom.